With a little imagination color this Cool Miley Cyrus / Hannah Montana coloring page with the most crazy colors of your choice. It would be so much fun to color a whole bunch of HANNAH MONTANA coloring pages like this. 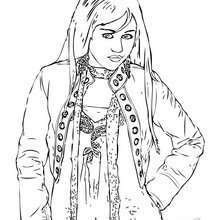 Add some colors of your imagination and make this Cool Miley Cyrus / Hannah Montana coloring page nice and colorful.